Free music is an opportunity for talented and creative musicians to stretch their wings and channel their inner-composer's impulse in the moment. Lots of space is given to the musicians in this quartet of two trumpets, piano and drums to do just that and the results are uplifting. "Kaze" is the Japanese work for wind...appropriate given the two trumpets at the center of this musical outing. 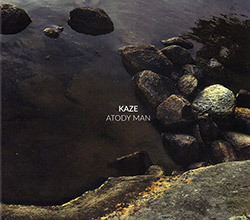 This session, the fifth release for Kaze, was recorded in June of 2017 in New Haven, CT, while on tour. The band, formed in 2010, is half French and half Japanese, but the music is its own wonderful thing. Pianist Satoko Fujii and her trumpeter husband Natsuki Namura are international collaborators and appear in many settings, but their approach is always creative, subtle, sensitive and beautifully expressive. While they are capable of high energy playing, they know when to lay off the gas and glide, and their French band mates, Christian Pruvost on trumpet and Peter Orins on drums can do the same. Right from the opener "Hypnotique Sympathie," there is a nice balance of composition and improvisation, where the two trumpets are entwined then fly off in separate directions. The balance between lyricism and the abstractions of extended techniques also work to create interest, with varying dynamics and complexity, as in the high-energy lines of "M�ta-Blizzard" which features some intense pianos rhythms from Satoko Fujji and some tightly navigated intricate ensemble lines. "Morning Glow" features an extended drum solo and an engaging ostinato figure articulated by the trumpets. There is some particularly fluid free blowing in "Inspiration 2" that starts with solo trumpet, then morphs to minimalist percussion and then the whole band explores sounds in a lowercase fashion...softly, gradually, nuanced, all while making use of extended techniques such as pedal tones, buzzing and wind sounds. Atody is a Malaysian word for "Egg". Does this allude to Satchmo's "Butter and Egg man"? Not sure, as the closing tune, "Atody Man", is an enigmatic piece that invites the listener to lean in and enjoy the thoughtful music that evolves in a very quiet and introspective fashion.